Facebook Marketing Mistakes – they can wreck your facebook experience. Are you new to facebook marketing, unsure of what to do, or how to do it properly? Do you want to know what the most common facebook marketing mistakes are and how to avoid them? In this post we share highlights with you from a great pod cast interview with social media expert Brian Carter, author of The Like Economy and LinkedIn for Business, conducted by Michael Stelzner of Social Media Examiner. Brian develops strategies and social media fanbases for companies of all sizes. In the article he talks about the misconceptions that facebook is like other marketing channels. But it’s not like other marketing channels and if you treat it as such that would be a mistake. You won’t be leveraging it as you could be. Facebook doesn’t work so well for product marketing. That’s not the behavior that people are doing and that they want to see. 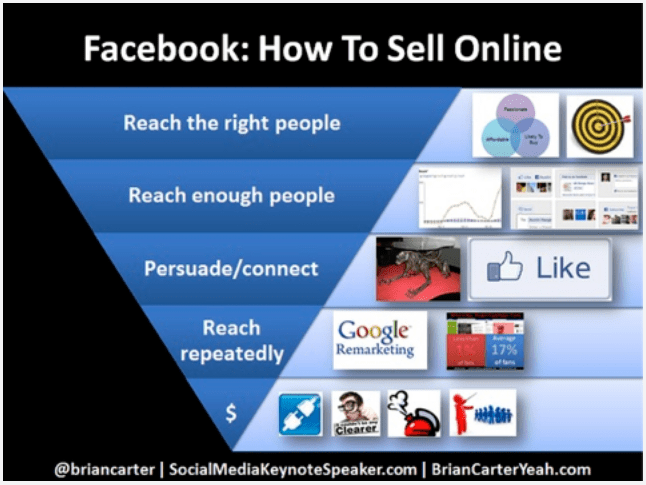 You have to USE facebook not just treat is as a means to sell products. This requires a mind set shift. Moving away from features to benefits can be advantageous, but still not good enough. Bridge the gap by selling the dream and the vision. Turn your message into images, humor, education, motivation, inspiration, and provide solutions to problems. Content creation and content curation (other people’s stuff) will get the attention of your readers. If you are not putting out engaging content that compels people to like share and comment, then you are committing facebook marketing mistakes, and your fans will stop getting your posts due to facebook’s formula. Experiment with new posts regularly and gauge the engagement using the reports that are available.. and get personal. Some of the biggest mistakes people make when posting on facebook is not reaching the right people. Another mistake is not reaching enough of the right people, and not reaching those fans over and over again. Facebook’s edge rank algorithm regulates this reach and if you are not giving them what they want to see you get lost and forgotten. Give them what they want… more images than links. Then you have to persuade them and stay in front of them until they are ready… shorten the sales cycle if you can. Use your metrics and reports so you know what’s working and what’s not. It’s not about how many fans you have or how many fans you get… it’s about how many of your fans newfeeds are your posts showing up in. Yes you have to keep growing your fanbase but you also have to be creative and constructive in your posts to keep growing engagement. Quality fans is where it’s at today…are they good customers or prospects, are they passionate people, are they affordable, and are they buyers. Here’s our hot marketing tip for the day…if you get anything, get this… if you are sharing content and you want maximum exposure…..dominate with images…it’s the new way and it’s what facebook users most want to see. The bigger the better. Use the new image upload feature on your business page and upload a high quality image to your post, however you have to do it. Take from articles including the beginning words of the article, or any cool image of the original blog post – include text and paste in the link. Now you have clickable images that will get you better calls to action. One more big tip…after you add your attention grabbing image, your text should include “click Like if ….” (fill the blank with anything relevent and that will get people to engage. This is a call to action that will get people to like your post. The more that like your post andAnd make sure your image is linked to wherever you want them to go when they click to open. Previous Post Common Social Media Methods That Create More Interaction Next Post Fear of Video – Can You Relate? Hurrah! Finally I got a web site from where I be able to really get valuable data regarding my study and knowledge.